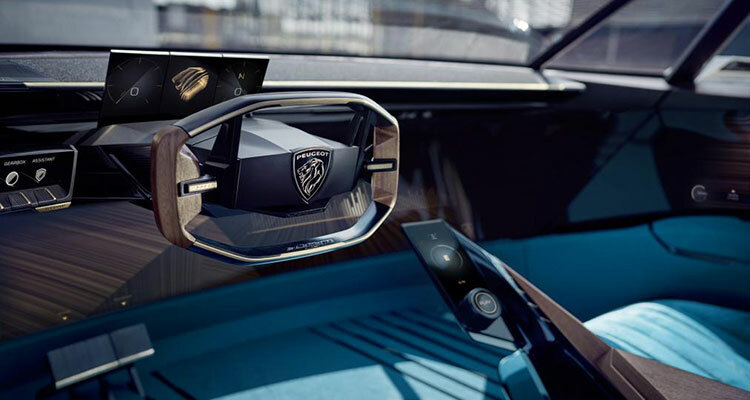 The Paris Motor Show 2018 starts on 2 October and this year one of the sure-to-be-a-hit vehicles on show will be the intriguingly named Peugeot e-LEGEND Concept. While many new cars (and especially concepts) manage to arrive with a cumbersome name, this one creates interest prior to even seeing the car itself. Fortunately, the car looks pretty good; not unlike something we might see James Bond or John Wick driving in a future film or two. The styling borrows form the successful Peugeot flagship 504 coupé of the late sixties, a car that also debuted in Paris and went on to be voted European Car of the Year in 1969. 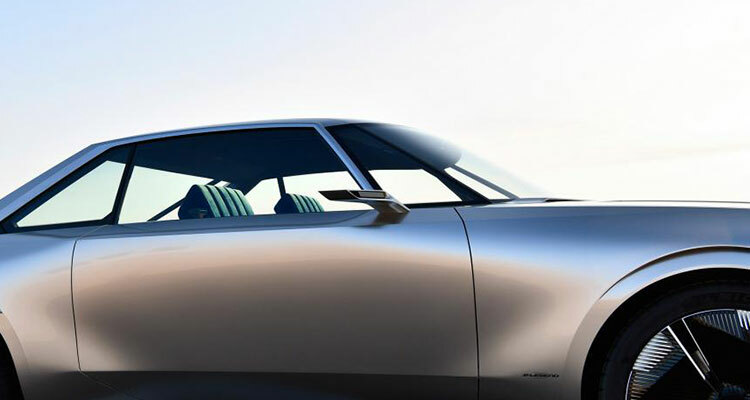 Though while the profile might be similar, the e-LEGEND Concept brings us right up-to-date. The e-LEGEND when viewed from the front seems to be all grille, which gives it a muscular look not too dissimilar to the American muscle cars of the 1970s (though this is mostly just pure design over function). The Peugeot badges front and rear are also illuminated. In short, it’s a fine looking beast. Rather at odds with the classic retro front view, the short rear end view appears, arguably, a little too modern maybe – but viewed from the side the e-LEGEND oozes class with a stylish sweeping concave mid section. Some angular 19-inch wheel rims offset the sweeping lines of the side view beautifully. 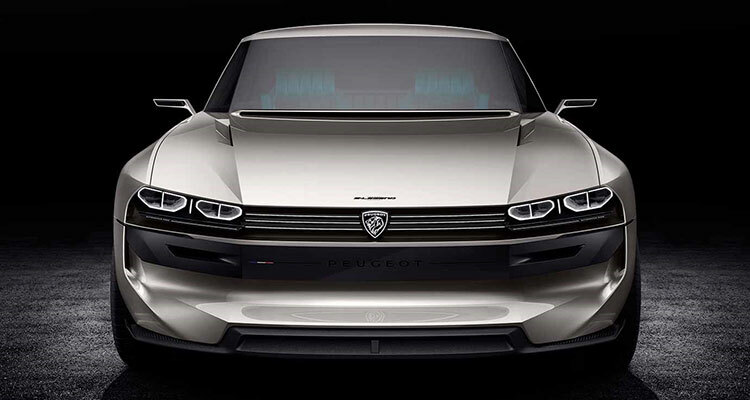 I think it’s fair to say that Peugeot has got the exterior of this concept pretty much spot on. The aluminium bumpers are finished in black and protrude slightly from the body, rather like separate retrofittable bumpers of the past. They’re not just for show though, safety standards are paramount and the e-LEGEND bumpers have the job of protection in relation to the trend towards modern car overhang due to sophisticated built-in bumpers and safety requirements. 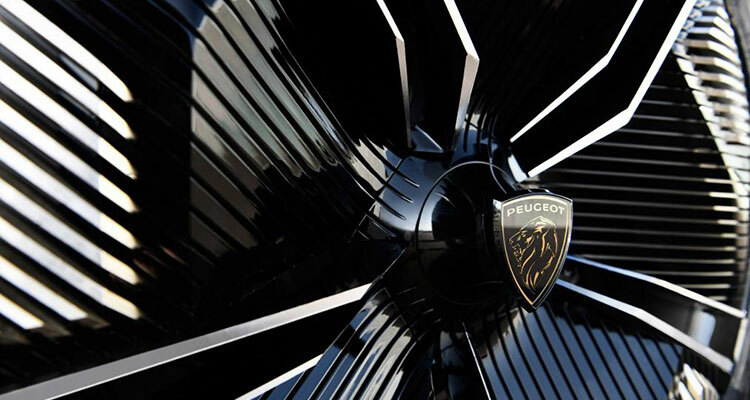 It’s something Peugeot “want to explore” according to Director of Style, Gilles Vidal. Not immediately obvious to the eye are the twin side cameras, which replace the car’s standard side mirrors. In 2014, a ruling was introduced to the effect that all new vehicles under 4,500kg must be equipped with a rear view camera by law. Tesla petitioned and tried to push the boundaries further by introducing side cameras too and thus decreasing vehicle drag factor by 2-7 per cent. The Alliance of Automobile Manufacturers also said that this would decrease fuel consumption by just over 3 per cent. In 2016 BMW revealed a BMW i8 Mirrorless with side cameras, which removed any blind spots from the driver field of view. Then, earlier this year Audi joined the gang with the option being available on the E-Tron EV. The cameras will display on two screens on the inside of the Audi’s doors. It remains to be seen how drivers will adjust to the potential lack of depth of field and perspective that cameras offer over a direct ‘moving’ responsive reflection – after all, there are many that still find it hard to get used to the disorientating effect of some rear view cameras. 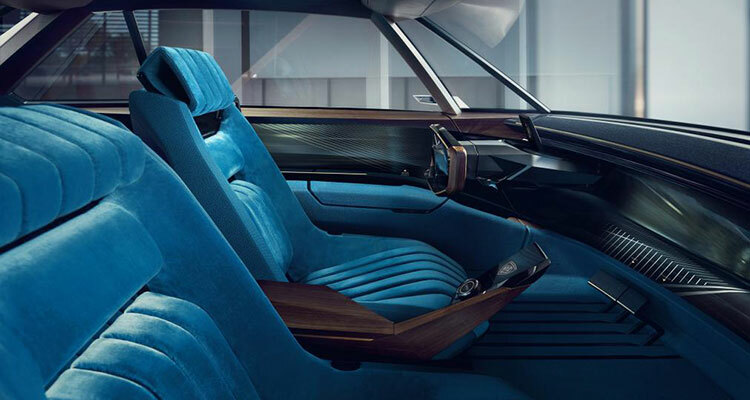 The e-LEGEND interior is a modern as you might expect for a concept vehicle in 2018 adding some lovely retro and luxury touches too. The seating consists of silk velvet in a nice muted shade of blue/turquoise while wood trim can be seen where it matters. A digital screen sits behind the steering wheel, while the door cards are made up of a pair of 29-inch screens. The sun visors also reveal a pair of 12-inch screens, while the main infotainment screen is a curved 49-incher. 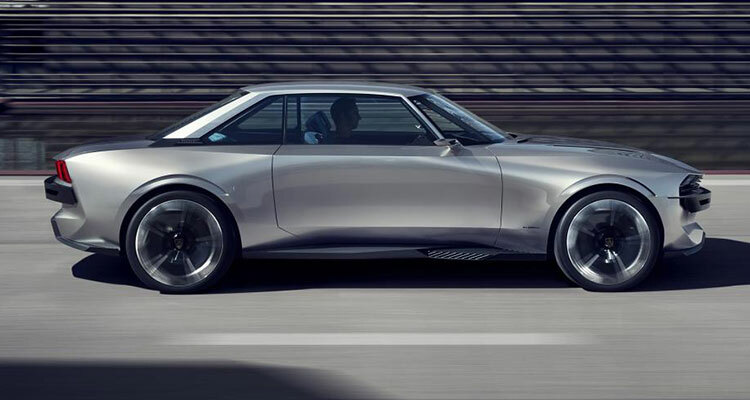 Power is an impressive enough 456bhp and comes from a 100kWh battery feeding the e-LEGEND Concept’s all-wheel drive. A healthy range of 373 miles and a top speed of 137mph complete the crucial bits. 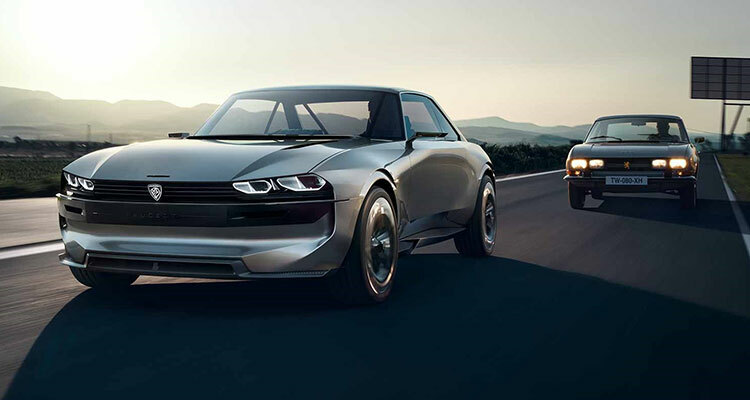 If you’re in a hurry, rapid charging technology (you may already have something similar on your smart phone) allows you to charge the e-LEGEND by up to 80 per cent in just 25 minutes. Will it go into production? 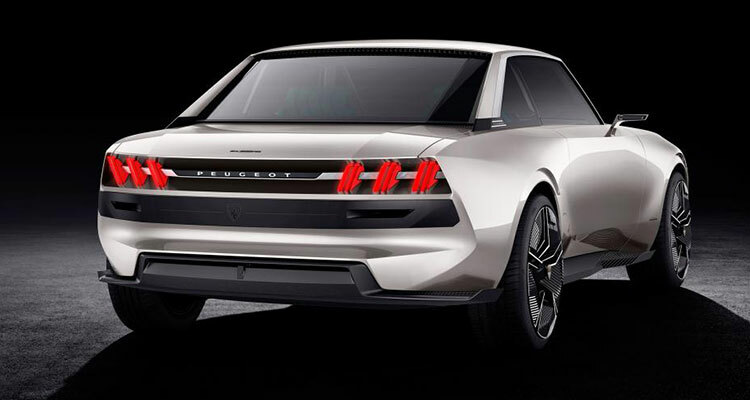 Peugeot aren’t revealing anything along those lines as yet, but I’d put a healthy wager on there being an excitable clamour to see this car on our roads in the future once the public gets to see the e-LEGEND Concept in the flesh.